We are often asked about the process we use to create a proposed office design, and in many cases, we respond by referencing the brief supplied by the client, but increasingly, we are witnessing an adoption of an evidence based office design approach. What is evidence based office design? Essentially, evidence based office design collects qualitative and quantitative data from a client’s workplace through a variety of means including, time utilisation studies, observational studies, staff surveys, workshops and interviews. This data is then used by the office design team who analyse and interpret it before using it to create a space plan and office design that reflects the needs and desires of the client. How do office designers use the ‘evidence’? The data provided will highlight where staff spend their time within the workplace, what teams and individuals interact and work closely with each other and also what people like and dislike about their current space. 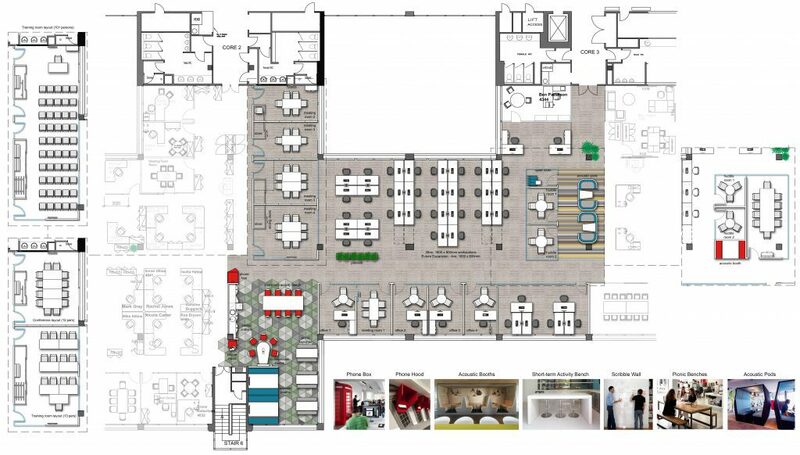 Consequently, this will inform the design team on what spaces need to be included in the new space. For example, does the business need as many meeting rooms or would a selection of breakout spaces with sofas and/or bench seating where people can chat or collaborate, work better? It can also show how long staff spend working at their desk and where they tend to spend the rest of their time, and in some instances, can highlight the need for quiet zones or rooms where people can concentrate or hot desking areas for staff who aren’t always in the office. The data also shows what teams work closely so can help to create what designers call adjacencies i.e. what teams should sit next to each other. For example, marketing and sales teams often work closely on campaigns, so it makes sense for them to be closely situated to foster easier and greater collaboration. Similarly, the data can indicate that teams like HR and Finance teams, who may require more privacy, have a requirement for smaller, private meeting rooms to be situated close by. While the data on its own can appear incomprehensible and somewhat overwhelming, it allows us to create a picture of how the future workplace should work while also developing the original brief to include key considerations identified via the collected evidence. For designers, the availability of hard evidence to justify design decisions is massively important, especially when faced with opinions of key stakeholders that are founded upon assumption rather than fact. A common assumption is that ‘we need more meeting rooms’ or ‘we never have enough meeting rooms’, which in many cases is the result of individuals or small groups using large boardrooms, when a smaller meeting room or break out space would be better suited. Data from utilisation studies can pinpoint this and other issues such as people using meeting rooms to take calls as there are no private areas – a solution here would be to include some phone booths. 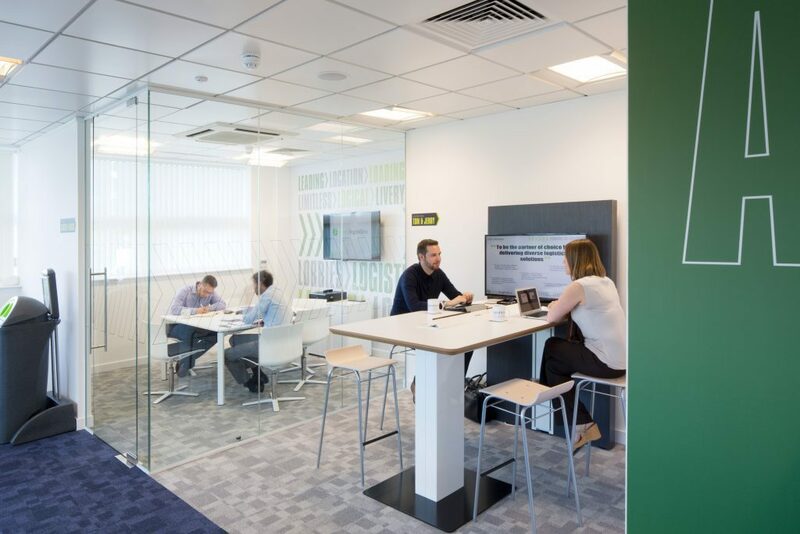 The objective is simple – to create a workplace that caters for the needs of all staff and that provides them with a choice of spaces within the workplace that allows them to work effectively. Crucially, the data allows us to identify these needs and spaces, and to incorporate them into the office design process. The office continues to evolve at an unrelenting pace, and while office design can be wholly subjective with not everyone liking the colours or furniture choices, evidence based office design provides companies with an approach that identifies and validates decisions made when creating their new workplace. The old adage that ‘Information is power’ does apply here but it is worth pointing out that while this approach can sound particularly scientific and non-engaging, it need not be. In reality, embracing an inclusive, collaborative approach to collecting the necessary evidence is paramount and it is recommended that all staff be encouraged to participate and share their opinions. This can mean scheduling stakeholder workshops, distributing anonymous surveys and/or large town hall style meetings. While the evidence based approach to office design is not altogether new or revolutionary, the way data is collected is radically changing. Today, many companies use apps like Observe (produced by Gensler) or OccupEye, that provide workplace utilisation data, that can highlight via heatmaps and graphs, the most popular areas of the workplace, at any given time. The digitalisation of the data collection means that data can be collected far more easily and in real time, hence the growing levels of adoption. It’s impact on the workplace is still only in its infancy and we can expect to see it playing a pivotal work as time passes. Other digital innovators like ShareDesk utilise this information to allow anyone to book desks, work areas and/or meetings rooms in any participating workplace, an Airbnb of sorts for the workplace. 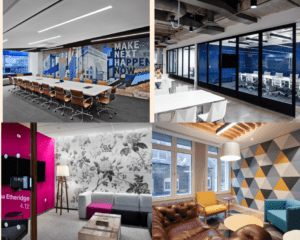 With the dawn of the gig economy in the UK, and with companies looking for innovative ways to save on property costs, the popularity of apps like these and the adoption of evidence based office design is surely set to grown and grow.